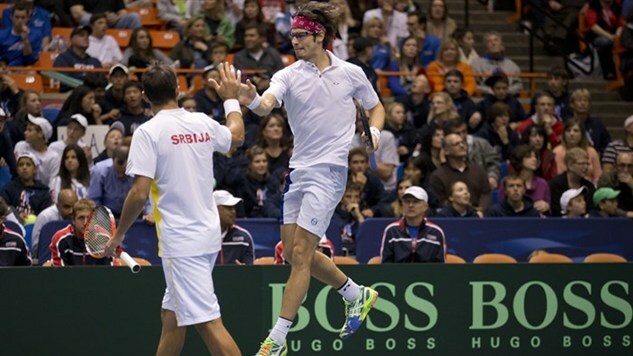 Five month ago – April 6th 2013 – the Serbian Davis Cup team beat the USA in Boise (Idaho). One important element of the tie between the US Open and Serbia was the sensational doubles victory of Ilija Bozoljac and Nenad Zimonjic against the World Number 1 Team Bob & Mike Bryan. The Serbian team – both already fathers – were big outsiders in this match. Although Nenad Zimonjic is one of the best doubles players in the world. Some of the TV Commentators were saying “How can you let this guy [Bozoljac] play in such an important match”, but he showed them why he is worth to put him in the team and on the court. All Fans in the arena were on the edge of their seats throughout the 4-hour, 23-minute match. At the end it was called Game, Set and Match SERBIA 7-6(5), 7-6(1), 5-7, 4-6, 15-13. An epic final. The biggest surprise during this match was Ilija Bozoljac. At this time the father of one daughter was ranked 335 in singles and 1,150 in doubles. “We have seen a lot of people in this competition rise up. You look at the numbers next to the guy´s career; you see the performance today, something doesn´t add up. You clearly see there was some inspiration, chemistry with Nenad on the court and you say, “Too good” said Jim Courier about Ika Bozolac. This weekend the Serbia team will meet the Canadia team at the Kombank Arena in Belgrad. Novak Djokovic will start against Vasek Pospisil followed by Janko Tipsarevic vs. Milos Raonic. The winning team from the US Nenad Zimonjic and Ilija Bozoljac are nominated to play against Daniel Nestor and Vasek Pospisil in the doubles. Can this team repeat their victory and help their team to go to the final???? The 2nd Semifinal of the 2013 Davis Cup by BNP Paribas will be help in Prague between the Czech Republic and Argentina.